Online counselling. Counselling to improve feelings. 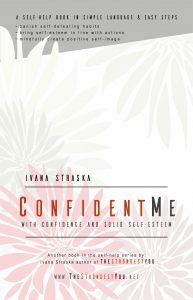 Confident Me (with Solid Self-Esteem & Confidence) – Ivana Straska, M. A. This book helps people caught in the trap of low self-esteem and lacking confidence. It guides the reader to change negative thinking about self and enhance strengths and qualities. The reader learns to build confidence with restructuring of their thinking, assertiveness, mindfulness, compassion, visualization, and much more. The book provides comprehensive strategies to change the habits that erode self-esteem. The paperback has space for the reader’s writing and it includes QR codes to easily access additional free resources. E-format of this book includes direct links to these resources. * Recognize personal values. * Build confidence based on personal uniqueness. * Learn to enforce strengths and positive feelings about self. * Learn strategies to banish self-defeating habits. * Bring self-esteem in line with actions. * Learn to think and feel positively about self. * Apply mindfulness into self-esteem. *Learn techniques to change thinking errors. * Learn how assertiveness and other strategies improve confidence. * Understand why acceptance and compassion help to self-esteem. What people say about this book? http://A carefully constructed book taking the reader on a journey of building self-esteem based on personal values. Solid self-esteem is not tangible but is something that people need to smoothly move through life and do it with joy. Self-esteem is a core psychological asset allowing the utilization of skills and potential. Solid self-esteem works as psychological immunity. It protects an individual’s strengths and allows personal adequacy. The good thing about self-esteem is that nobody is born with low or high esteem. Almost anyone can build a solid self-esteem.